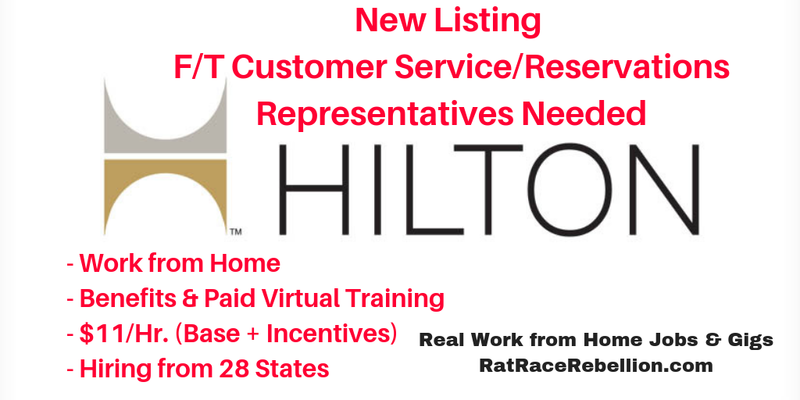 Work from Home Jobs – Hilton Hiring Again – F/T Reservation Sales/Customer Service Associates – Benefits – Some Equipment Provided – Paid At-Home Training – Earn Up to $11/Hr. *** Short Fuse Alert — These jobs usually fill fast, so apply or share quickly if interested! Hilton just posted that it’s hiring full-time Reservation Sales/Customer Service Associates. Benefits, virtual training, some equipment included. In this job you’ll be booking reservations for Hilton customers via inbound calls. Pay Rate Up to $11/Hr. Update — RRR Facebook members report a base pay rate of $11/hr. (recently raised). Hilton’s job FAQs — which we assume are pending an update — report a base rate $9/hr., with up to $2/hr. more with incentives. Requirements include a HS diploma or equivalent, three years’ steady job experience in a customer service-oriented and/or sales role, plus one year’s experience in a role where you had to meet goals and do some cross-selling and upselling, and/or negotiate and overcome objections. To go to the job listing, click here. For Hilton’s job FAQs, click here and scroll down. To be the first to hear about jobs like these, like our Facebook page. Facebook members also share tips on applying for jobs and their experiences with the companies we cover. Good luck in your work from home plans! This entry was posted in Customer Service Jobs, Jobs with Benefits, Reservations Agents, Work at Home Jobs and tagged Hilton. Bookmark the permalink.